COLOR / PD10 (pink brown) / PD13 (ash gray) I have been repeated buying it many times. I often color my hair in ash tones, so PD13 suits my hair well. And PD10 is just right for my originally reddish hair color when the hair color fades away. They have many colors in cheap price anyway, very handy product for me who frequently changes hair color. The pencil has a soft and easy-to-draw core, yet it had never broken. Excellent. The powder had run out when I used it to fill the gaps of eyebrow, so you may need to control the amount of use. I usually use only cosmetics sold in a department store, yet for an eyebrow, I use this cheap one. This is super good. Good color, easy to draw, can smudge at the same time... I loved this product and have bought it several times, but the pencil lasts so quickly...(i_i) The difference of reduction between the powder was too large and I didn't like buying the whole new stuff every time without finishing powder, so I'm using another product now. I would have continued using it if there was a refill. 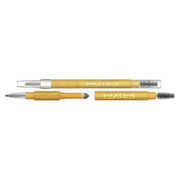 Both pencil & powder has an excellent usability, color and finish! I will buy it again if the refill is on sale. I'm using the second one now. I chose 01 that seemed safe, but it was too light than I expected. (I have dark brown hair.) So I bought 05 this time, and it has very natural shade and blends so well with both hair and skin. As a feeling of use, the inner end of eyebrow sometimes comes off in sweaty days, yet overall it lasts long. It finishes fast since I don't use powder part and drawing eyebrows with only pencil, but I will buy it again for its reasonable price. This has totally saved me, since it's got a brush, pencil, and powder in the same product, which cuts way down on the stuff in my makeup bag. It's really convenient, so I've already picked up a bunch of them. It comes in a lot of colors, so if you want something bold, you can go bold, but it you want something more natural, you can do that too, so you can definitely find one that goes with your look. It's a pretty sheer powder, which I think goes well with the pencil when you blend them together. It's not like it's absolutely the easiest to use, I think you can get the job down without any real problems, and it's a three in one deal, which I think makes it pretty good! I only pluck excess eyebrows and shorten long eyebrows, so I bought this to perfect them. At first, I would trace my eyebrows from the outside to outline them and then fill them in with pencil and finally apply powder or use the brush to remove excess powder. But I learned from a book called "Mature Stylish Make-up" or something that I should darken the inner side of the eyebrows with pencil and then fill in the outer curve with powder and then use brush to brush off excess. After started to draw properly people started to say I look cute! I learned that eyebrows are important. I recommend this because it's easy to use.